We entertained for the first half of Nancy and James Rigas wedding reception @ the Detroit Marriott Renaissance Center. They are a really laid back couple, so I have been looking forward to the big day for quite sometime. Since they had hor dourves in the foyer we setup remote sound in a secondary location so that guests could hear lite cocktail style music when arriving. Now I wish I really took a picture of their hor dourves table because there was this Greek style finger food that tasted phenomenal. It was shaped like a samosa and was covered in phyllo dough. The filling was a mixture of spinach and cheese. What I thought was really cool, was that for each table they had a card with a word on it (Motown, BEER!, Flying Toasters, Greece, International, GM Employees) and basically whatever name/area that resembled you, designated your table. I have a picture of one of the cards above. Since Nancy and James family was from Greece, we played traditional Greek style wedding reception music (I have a video link below to one of the Greek dances). 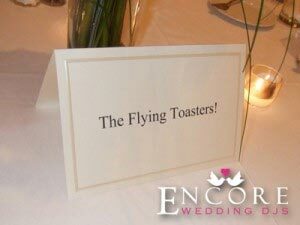 And for those of you wondering, Flying Toasters is the name of the band from Indiana that played during the second portion of the reception. They did a great job! You can view their satisfaction survey at the link. Congrats Nancy and James and enjoy your honeymoon in Greece!